Is Microsoft “the only [company] doing serious innovating with Linux?” That’s Jessie Frazelle’s contention. Frazelle, who rose to prominence in the developer community with Docker and later Google Cloud, made the bold claim to justify her departure to Microsoft. On its face it seems silly, an over-exuberant claim to justify a career move. And yet it does suggest a very possible future where Microsoft doesn’t merely accept a peaceful coexistence with Linux, but instead enthusiastically embraces it as a key to its future. No, I’m not talking about making things like SQL Server run on Linux. That’s table stakes for serving the polyglot reality of enterprise computing. Rather, Microsoft must make a real commitment to Linux, one that has it as an active, visible contributor thereto. Fortunately, there are signs that this is starting to happen. Microsoft, of course, is not the demonic overlord of proprietary software that it once aspired to me. The days of “Linux is a cancer” Ballmerisms of 2001 have faded. We now live in a cloud-eat-cloud world where Microsoft can’t afford to not run its software on Linux and contribute actively to open source projects. This does not, however, support Frazelle’s “innovation” contention, particularly when she goes further in declaring that the Linux innovator award is “not even close,” claiming it is instead a runaway victory for Microsoft. The reality is that Microsoft, open source heavy that it has become, can’t even crack the Top 30 contributors to the Linux kernel, according to the Linux Foundation’s latest report. 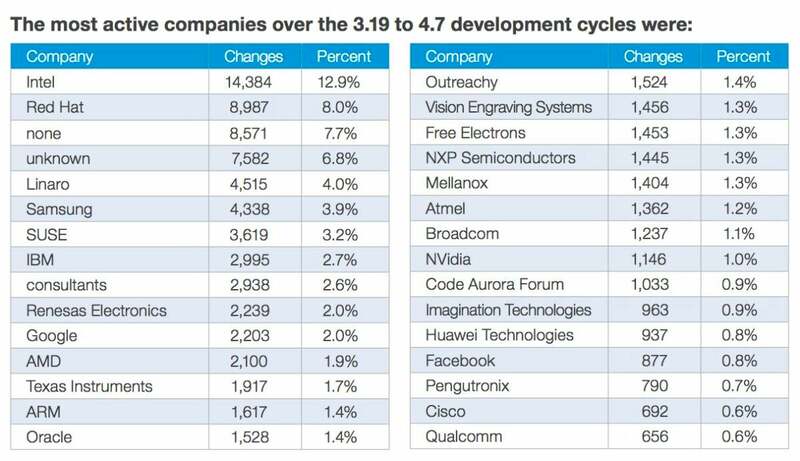 The top Linux contributors for version 3.19 through version 4.7 developmenrt cycles. Indeed, when I asked Linux Foundation executive director Jim Zemlin how far down the list of contributors Microsoft currently sits, he told me Microsoft is currently the 47th largest contributor. That’s not anything to brag about. Yes, Microsoft joined the Linux Foundation last year as a Platinum member, but that’s not innovation. Heck, the first sponsor of the Open Source Business Conference, which I started in 2004 and ran for 10 years? Microsoft. It was welcome then, but Microsoft was not innovative then or now. The company released the open source .Net Core 1.0; partnered with Canonical to bring Ubuntu to Windows 10; worked with FreeBSD to release an image for Azure; and after acquiring Xamarin, Microsoft open-sourced its software development kit. In addition, Microsoft works with companies like Red Hat, Suse, and others to support their solutions in its products. This is the yeoman’s work of being a successful platform. It’s useful but not particularly innovative. But that is not to say that Microsoft isn’t innovating around Linux. When I challenged Frazelle on her statement, Frazelle was quick to point out that she wasn’t referring to Linux kernel contributions but making more a statement about “innovations with Linux” and to “look at who is using Linux in crazy ways.” Or, more important, in not-so-crazy ways. Frazelle, remember, has a strong container pedigree. In that area, Microsoft more than earns the “innovator” label. Even seemingly pedestrian work -- like making Docker containers work for Windows, not merely Linux — is a big deal for enterprises that don’t want open source politics infesting their IT. Or how about Hyper-V containers, which marry the high density of containers to the isolation of traditional VMs? That’s a really big deal. 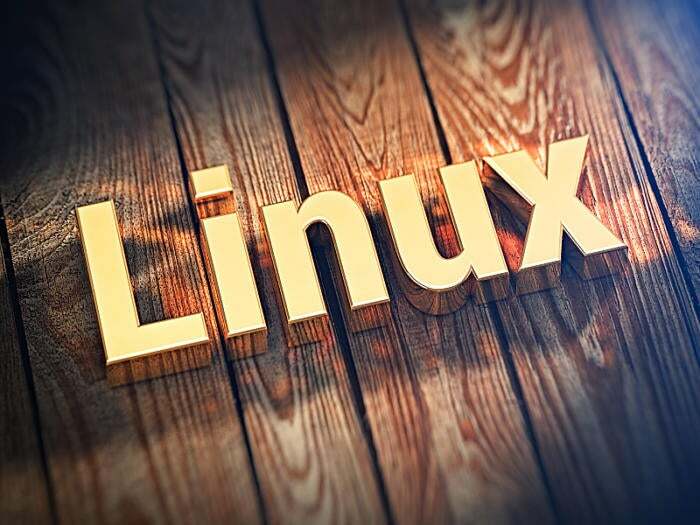 Microsoft’s commitment to Linux has been such that over the past year the percentage of Azure VMs running Linux has jumped from 25 percent to 33 percent, according to Microsoft Azure CTO Mark Russinovich. In short, maybe the more accurate tweet would have been that Microsoft is the only company doing serious innovation around Linux. Although that would be up for debate, Microsoft has changed so much that most of us would at least consider the statement. Even so, given just how dependent Microsoft increasingly is on Linux, it’s time for the company to not just innovate around the edges of the Linux ecosystem but to start contributing directly to the Linux kernel, commensurate with the value it derives therefrom. Ten years ago, Microsoft couldn’t do this without suspicion. Today, this is what we expect of Microsoft. Microsoft seems to understand this, and is finally getting serious about Linux. As ever in open source, it starts with people. Without fanfare, Microsoft has started hiring Linux kernel developers like Matthew Wilcox, Paul Shilovsky, and (in mid-2016) Stephen Hemminger. Hemminger’s hire is particularly interesting not only because he’s considered one of the big-time kernel developers, but also because it was he back in 2009 (while working for Vyatta) who called out Microsoft for violating the GPL in its Hyper-V code. In sum, the Liux Foundation’s Zemlin declares, “It is accurate to say they are a core contributor,” with the likelihood that Hemminger’s and others’ contributions will move Microsoft out of the kernel contribution basement into the upper echelons. Pigs, in other words, do fly. Microsoft, while maintaining its commitment to Windows, has made the necessary steps to not merely run on Linux but to help shape the future of Linux. Ten years ago, this would have been a ridiculous statement. Today, although Fazelle’s exuberant tweet seems a bit too optimistic, a year or two from now it may be considered obvious.